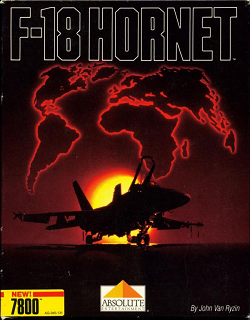 In this review, we get ready for take off in the Atari 7800 game F-18 Hornet. We find out how well this flight simulator game plays. This game was released in 1988. When you start the game, you get four missions to choose from – each with increasing difficulty. Each mission takes place in different parts of the world. The goal is to take out enemies with your missiles and land safely on the other side of the map. Like a lot of other flight simulators on this system, this game has a very steep learning curve. Unlike games like Tomcat: The F-14 Fighter Simulator, the learning curve can be overcome with a lot of patient and troubleshooting. While taking off and landing are pretty straight forward, mastering hitting your target and controlling the landing gear is a much taller order. The game apparently hijacks the systems Start button and other controls to allow for more control of the plane. Start, for instance, lowers the landing gear. The game forces you to go through a long tube worth of flight plan. While this may seem like an impediment at first, you aren’t really given anything for maps in the game itself. Having a straight flight path isn’t such a big deal knowing this. While there is some straightforward logic behind the game, the controls and steep learning curve has a way of making the average player feel like an idiot. Performing basic tasks require navigating some weird convoluted method of control. To me, it would make sense if one button fires and the other button opens up a small menu of basic control (pausing the game of course to allow for easier use). Naturally, something this intuitive is not to be found in this game. By the end of the round (where most players end up crashing the plane), you’ll b given a ranking based on how well you did. What you need to do to get higher rankings is, well, trial and error in the game itself. Generally speaking, this game is clearly not meant for general players. It is meant for people who are already fans of the flight simulator genre. This shuts out a large portion of the audience right from the get go. Even then, this game may not be for everyone thanks to the steep learning curve and convoluted controls. The only thing that can be said positively about this game is that it is easy enough for players to figure out how to take off and fire at enemies. So, you get more than a few seconds of enjoyment before failing miserably at the very least. Graphically speaking, there is a technological achievement being made here, while at the same time, it impedes the players ability to play the game. While the first person perspective alone is a nice thought, other games on this system alone have already achieved this. Mean 18 Ultimate Golf, for instance, handles a similar perspective in a much better fashion. The quality is so low, that you are basically flying near-sighted. It isn’t until you get up close and personal before you are able to see your target (let alone lock in, and fire at it). So, some enemy positions require foreknowledge. The only other great thing I can say is that the vibrating effect on take-off is nicely done at least. as far as audio is concerned, this game does leave a bit to be desired. All you get is a rhythmic percussion at the beginning for music. The sound effect may be OK, but you get no music otherwise. So, it’s a below average experience. Overall, there are some positive things to say about this game. It is more than possible to overcome the steep learning curve of some elements in this game. Unfortunately, the convoluted controls simply hampers play. Even for a more patient player myself, I found learning this game to be a taxing experience. Even after I grasped the basics, this game still had a way of making me feel like I’m not a smart player with the convoluted controls it threw at me. The graphics, while an achievement from the perspective front, leaves a lot to be desired. It is great to see the style, but the low quality ended up hampering play. The audio was below average with virtually no real music to speak of and average sound effects. So, a game for the really patient flight simulator fan, but otherwise not for everyone. Furthest point in game: Earned “Swabo” on level 1.